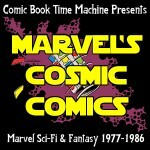 One Response to "Micronauts! (The Micronauts #1, January 1979) – MCC109"
That was great. My contact with Micronauts is very limited. I remember them in a back up strip in the Marvel UK reprint of Secret Wars, probably the crossover with the X-Men, but I wasn’t that interested in them. Then, many years later, when Rick Jones was partner to the Son of the original Captain Marvel, written by Peter David, and they came across the microverse, meeting characters that I didn’t know. When my appreciation for Bill Mantlo emerged and i came across not just his mainstream characters but the real odd ball stuff, then Micronauts is something I have kept an eye out for, but never found. This is a great introduction to the comic, the characters and your enthusiasm is infectious. Also, I have never seen any micronaut toys (or ROM ones for that matter) in the UK. We did have G.I. Joe, but we called him ‘Action Man’. That I had. I am looking forward to more Micronaut talk and when ROM comes along.